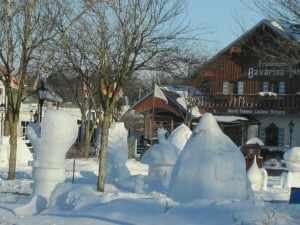 Snow & Ice Sculpture Gardens in Frankenmuth, Michigan - JP loves LIFE! There are times when travel adversity really works in you favor. And I had just that happen on Saturday as I was supposed to leave Michigan where I’d been to work with the ambassador program of the Great Lakes Regional Dairy Conference. I had flown into the Midland-Bay City-Saginaw airport and my friend Ashley Messing provided transportation to the conference in Frankenmuth. And if we’d gotten back to the airport in time for me to catch my scheduled flight, I would have only had the hotel, meeting & drive experiences. While those were all great, I had an incredible time with my return to Frankenmuth where I promptly got into tourist mode! When we’d driven into town on Thursday night, my head was spinning trying to catch a glance of the various snow and ice sculptures. And having showed up just 28 minutes before my flight was to depart (rather than the 30 minutes at which point boarding passes cannot be printed nor bags checked) I knew exactly where I’d head when I got back to Frankenmuth. Yep, the sculpture gardens! This was the 20th anniversary of the SnowFest was held this year and this 6-minute video provides a great preview of SnowFest on a local TV station. But these are sculptures from previous events cause I saw a whole different set! There were three different areas the bus driver from the Bavarian Inn (a blog post the Inn did on SnowFest) said I should see them all and he was right! My favorite ones…. that is a tough thing to pin down. In the US snow carving, I probably liked the plant from Little Shop of Horrors and the guy getting ready to club someone. In the international set, I loved the rockers but the wingspan of the eagle snagging that fish was truly awe-inspiring in snow and the jail was easily my favorite ice sculpture in the international contest. In the US ice carving set…. the simple dancers/gymnasts were great as was the dragonfly, the dragon, the mermaid, the swordfish… you’ll see what I mean with the photos. Tough to pick. Rather than trying to describe these incredible outdoor works of art, I’m simply going to post a slide show on it. I’d be glad to answer any questions. Have you ever seen someone do artistic snow sculptures? Glad you were able to extend your stay in Frankenmuth. Thanks for sharing the slideshow!